Great news if your a die hard Alien fan, Sky bring forth more news that the Space Jockey character who appeared in the original film Alien will appear in Prometheus, "as an eight foot animatronic", not only this but they are being re-designed under the guidance of original designer H.R Giger. This news comes a couple of weeks after Sky's claim that Prometheus would feature Aliens [Xenomorphs] and that the film was much close to an Alien Prequel than many speculated. "I’ve had further confirmation that the Space Jockey creature is definitely in Prometheus and has been built as an eight foot animatronic. 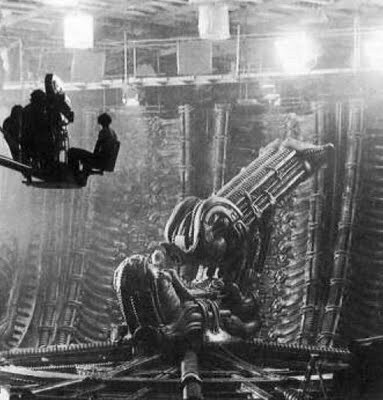 "I’ve also had it confirmed that HR Giger is working on the project but only in an advisory capacity. By the way, people are going to be in for a shock when they sit down to watch Prometheus and there’s an enormous semi-human head piloting a spaceship." To learn more about the Space Jockey go here. I'm reading: SPACE JOCKEYS APPEAR IN RIDLEY SCOTT'S [PROMETHEUS] H.R GIGER IS SUPERVISING DESIGNTweet this!